Having accurate data on the presence of rare species is crucial to implementing any protection strategy and is the stepping stone for any further study. Our surveys are designed to target four species - wolverine, wolves, Sierra Nevada red fox, and marten - and in addition, collect data on all carnivores to add to long term records. Both wolverine and wolves were extirpated from the the Mt Hood area about a century ago, however, with protection measures in place, their populations have been recovering and they have been moving back into parts of their original range. Wolverine have been documented in the Wallows in eastern Oregon and, in 2012, were seen on Mt Adams in Washington for the first time in decades. 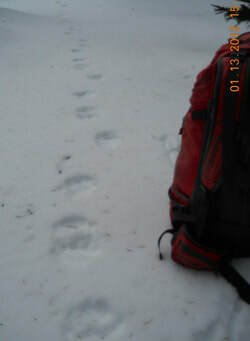 Rumors of wolverine in the Mt Hood area in 2003 prompted our search, however to date we have not found any evidence of them here. Wolverine can travel far, however, so it seems likely that they will return soon. Wolves are making an even more spectacular comeback. After years of unverifiable sightings, one radio collared wolf passed though the Mt Hood National Forest in 2015, heading south through the Cascades. More are likely to follow. Knowing whether these species are present is very important, especially for a top predator like a wolf, whose presence can cause a cascade of changes throughout the ecosystem. The Wolverine Tracking Project will keep a monitoring system in place that will be able to detect their presence when they eventually settle back into this area. Sierra Nevada red fox is another target species. This rare subspecies of red fox is found only in the high mountains of the Oregon Cascades and California Sierra Nevadas. In 2012, our surveys documented their presence in the Mt Hood National Forest for the first time, and genetic samples collected by our volunteers confirmed that they were indeed the Sierra Nevada subspecies. This subspecies migrated to this continent before the last ice age and, as the climate warmed, moved up to the mountains, remaining distinct from the red foxes that migrated to this continent later and now occupy the lowlands. We want to continue to collect additional information and genetic samples to learn more about their population size, population connectivity, and genetic uniqueness. Although they were recently denied protection under the Endangered Species Act in 2015, many researchers feel this was made with incomplete data and is not warranted. This data we collect will be shared with Cascade Carnivore Project to contribute to a region-wide study of these fox. Our fourth target species, marten, is an indicator of healthy old-growth, upper-elevation forests. Previous surveys have consistently documented their presence where there is suitable habitat. We would like to continue to monitor these areas to see if we note any anecdotal changes to their population that would need to be followed up on. In addition to target species, our surveys also collect data on all carnivores to add to long term records. Probable climate change and burgeoning population growth in nearby Portland, with attendant increases in recreation and other land uses, can bring about fundamental changes to wildlife habitat, making the need for long term surveys even more important than before. All data is shared with the Mt Hood National Forest, Defenders of Wildlife, Oregon Department of Fish and Wildlife, Cascade Carnivore Project, and the US Forest Service PNW Research Lab. By collecting data on wildlife use and making it available to those who need it, we improve the knowledge base that management decisions are made on, which in turn improves the chances that viable populations of native animals can be maintained.